Atma — Multipurpose Wellness | Sport | Yoga Site Template Created by 3jon. 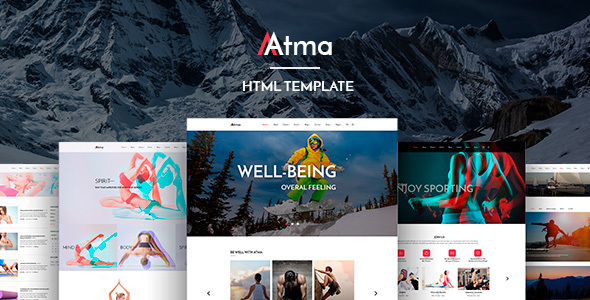 This templates have specific characteristics, namely: Atma is a creative, modern and responsive theme designed mainly for Sport Clubs, Health Clubs, Gyms, Fitness Centre, Personal Trainers and other sport and health related clubs and it is suitable for any kind of sport activity . You can use this Atma — Multipurpose Wellness | Sport | Yoga Site Template on Site templates category for aerobic, blog, classes, coaches, crossfit, fitness, Fitness Clubs, gym, health, sport, trainers, training, wellness, workout, yoga and another uses. In one package you will get 3 ready templates with flexible settings, that can easily satisfy all your needed. It comes loaded with many useful features, such as Timetable, Classes, Events, all store pages and payment etc. Atma Design is clean and professionally, so You could easily customise everything. This trending and functional design of your site will impress any of your customers.